Was poking about in the dust yesterday, had to dig down to a double spade length to find soil that looked like it was visited by water at any point in its existence. Fortunately this a.m. awoke to find my paper between the doors - thank you delivery man - and a gentle rain coming down. Over the weekend I did some potting up. Was given some little test Mighty 'Matos that I'd been cruel too - outside/inside doing the Hokey Pokey when it was most likely too cold, and then for no good reason other than they were just outside my wingspan when I was watering - managed to completely miss them on my watering run. 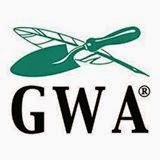 I saw that the graft looked fine, but had to lop off a fair bit of the top of the plant that was d.o.a. I decided do plant them in pots as an experiment. Apparently they are the goldfish of tomatoes and will grow in size according to the size of the pots. Was given some not altogether appalling plastic pots that I think are supposed to look like mid-century-modern-reproductions from the brass age. Perfect for test purposes. And should it work well, I'll look for some pretty clay or glazed pots late in the season when they are on sale. And, some new signage which adds to the experience. 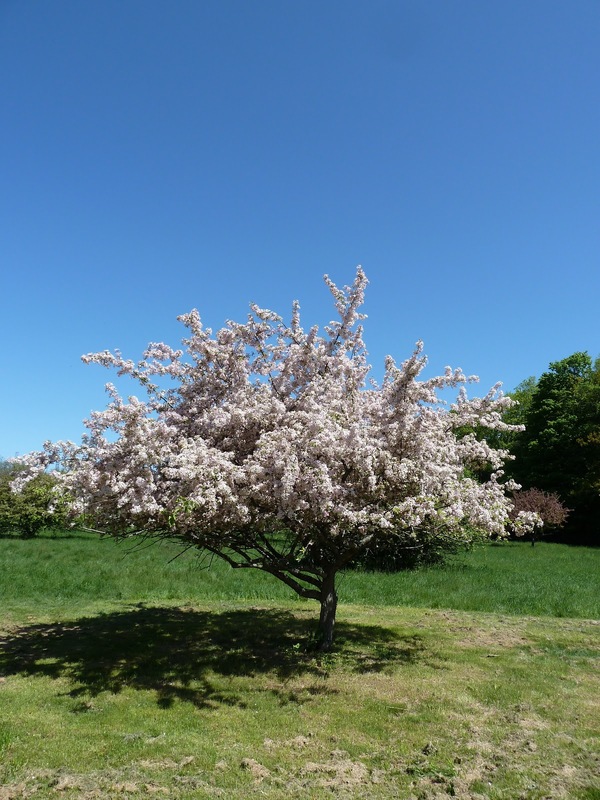 Though a little cool - a perfect sunny day. You can see that they're replacing some of the old lilacs that have been lost. The deer fencing is unattractive, yet essential. This must have made a good thump coming down. 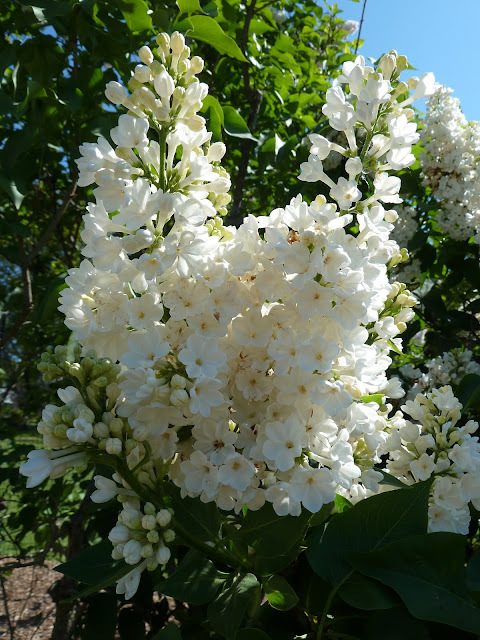 Interesting, lilacs rarely perform well in the shade, yet this variety, 'Winston Churchill' is doing beautifully and would make an excellent addition to a large property. The Cercis canadensis were just finishing up. The wonderful thing about the gardens these days, is you never know what you're going to find. 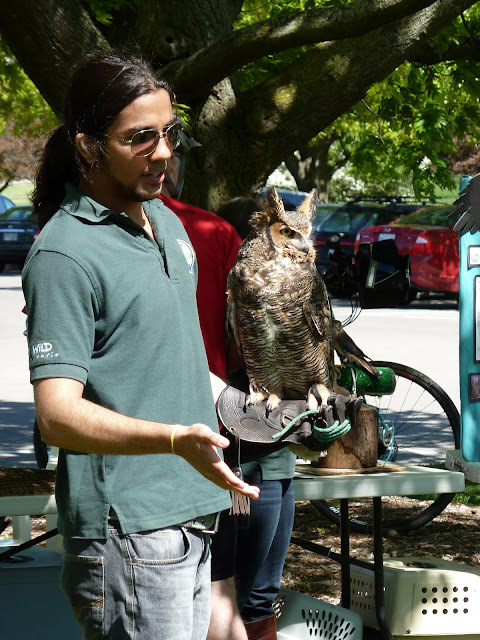 Look at the magnificent owl. 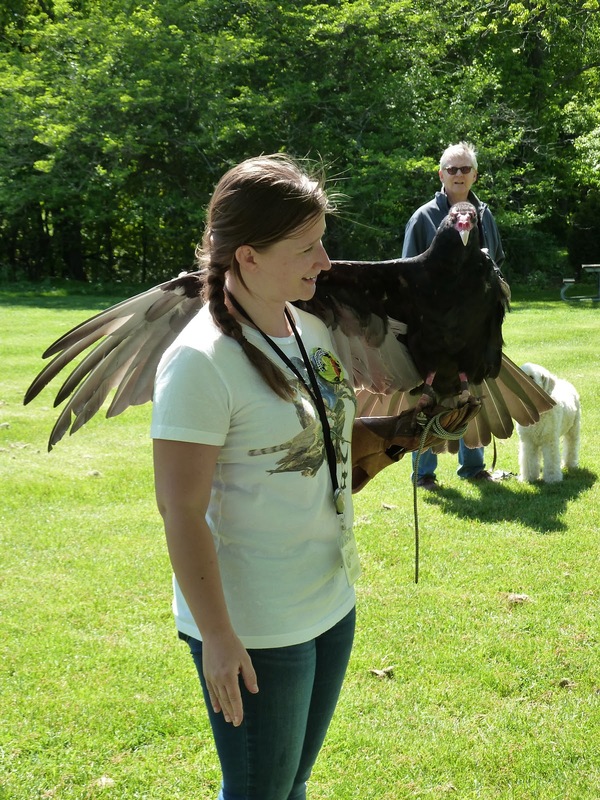 Nothing like the warm hug of a turkey vulture. Although the handler said it had more to do with sun tanning than it did with affection. Struck by how perfect the form was on this little Malus 'Hillier'. Now, when the lilacs are in bloom - it's usually a good time to visit the iris garden - not that many are in bloom just yet, but there are a number of Japanese Tree Peonies that are just lovely to see and photograph. 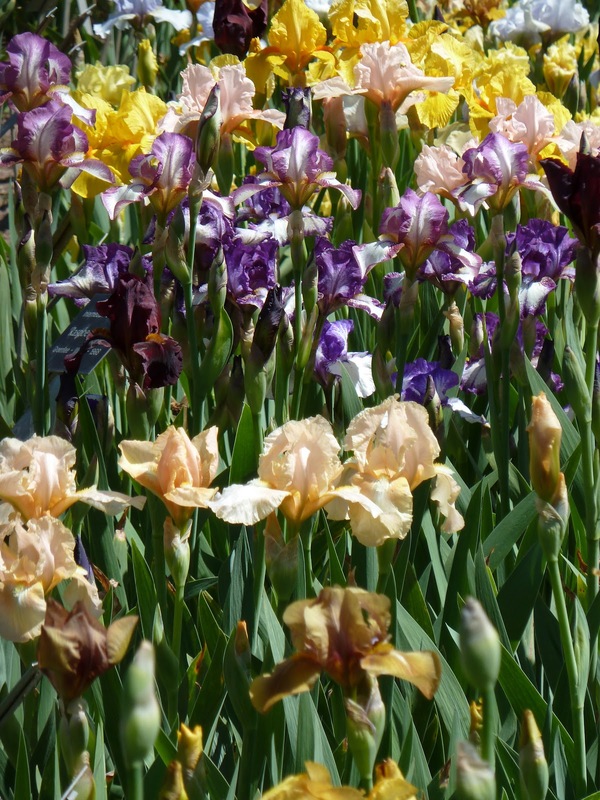 The iris pictured above, can just be seen next to the gazebo, if you click on the photograph and squint really hard. I'm glad they're returning to the old format of rectangular beds, from the burgundy leaf weigela Fleur de Lis shaped beds. However, it's going to be a while until they're anywhere close to their former glory. So a quick spin behind the iris-to-be-garden to the hosta garden with Bart leading the way. Kevin says this is one of his favourite spots of the garden. Not many people visit - few probably know it exists - and hidden behind the big patch of dirt, it isn't about to be overrun this year either. It's time to put on my rain coat and umbrella - Bart is explaining loudly it's time for his walk. Wow, I can't believe the change in the changes to the iris and peony beds. I wonder what they do with all the plants during the redesign? I actually have never been the part of the RBG where the lilacs are located. My lilacs are super this year after a huge disappointment last year. Most of them are common, but I did plant some dark purple ones a number of years ago and gosh they are lovely. The individual flowers are twice the size of the common lilacs (which still have some charm of their own). We went on the Ward Island garden tour this past weekend. Tons of walking, but what a pretty place. (I can't believe I have lived in Toronto all these years and have never made it out to the islands!!) On Sunday I (crazy person that I am) did the Cancer Society Tour in Mississauga. What a disappointment this year! Too many swimming pools and professionally planted hostas. At any rate, I always feel a bit pathetic pulling up to huge estate houses in my red Toyota that has seen better days. 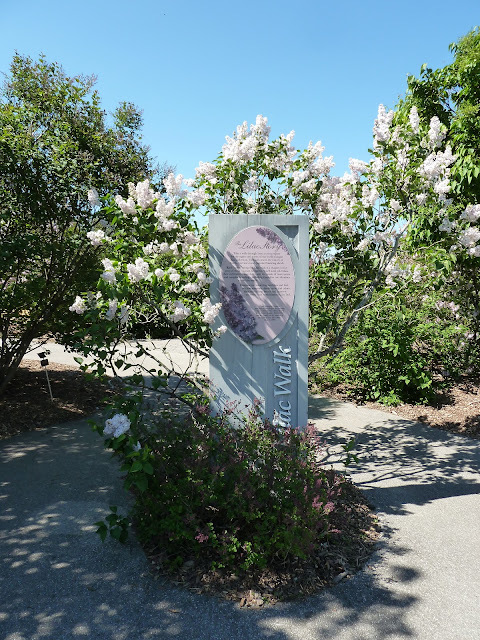 Did you see the preview on the Toronto Gardens blog for the Through the Garden Gate? That tour is looking really promising. 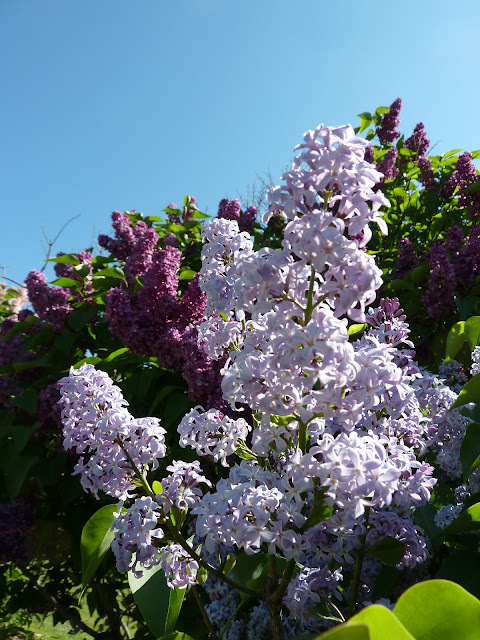 I love lilacs, and can imagine how heavenly the fragrance must have been. The picture with the turkey vulture is very funny! Jennifer, I was shocked - thought I'd be looking at young plants in the old garden - not a total gut and redo. They've got lots of property. 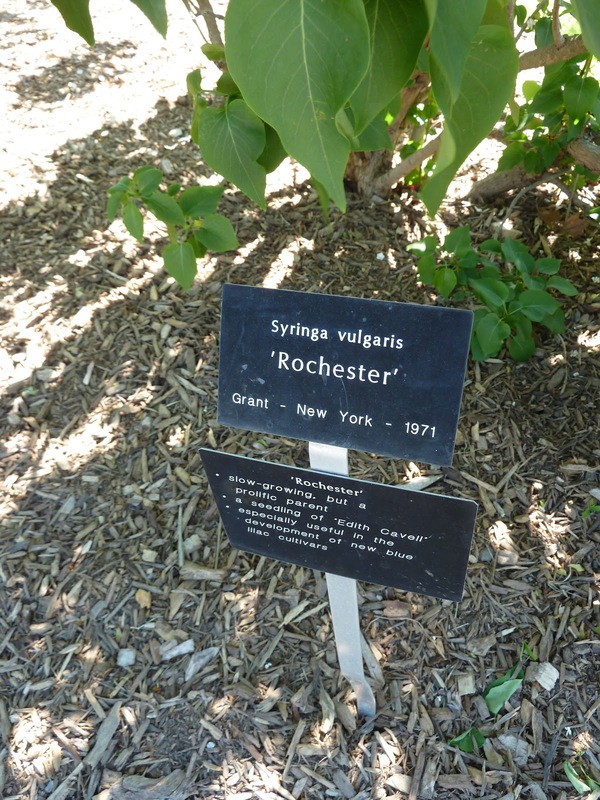 I'm thinking they must be up around the old greenhouses, but don't know for sure. The lilacs are divine this year. One of the best years ever - something that really appreciated our nice cold winter. Toronto Island is something I always make sure a visitor does when they are in town - sometimes I think Toronto looks better from the island than anywhere else. Thanks for the heads up about the Through the Garden Gate on the Toronto Garden Blog - they always find such lovely gardens to visit. Peggy and I are looking forward to next week...... And, I say better a beater that's paid for than a 5 series beemer that belongs to the bank. Jason, the scent was marvellous and you're right, I went back and had another look at that photo and had another giggle too.